This is the captivating true story of the young Elizabeth I, as she struggles to survive the treacherous world of Tudor England. After the death of her father, Henry VIII, a young Elizabeth journeys to London to live with her father's widow, Katherine Parr, and her new husband, Thomas Seymour, brother-in-law to King Edward. Surrounded by malicious whisperings of her late mother's witchcraft, Elizabeth is desperate to escape suspicion and discover the truth about her mother. A young stranger asserting Anne's Boleyn's innocence sends her on search a that takes her on a dangerous midnight journey to Bedlam, the hospital for the insane, to meet her mother's former lady-in-waiting. This encounter changes the way she views her mother - and herself. Meanwhile, at home, Elizabeth's reputation is increasingly under threat, as her stepfather, Thomas Seymour makes unwanted advances toward her. 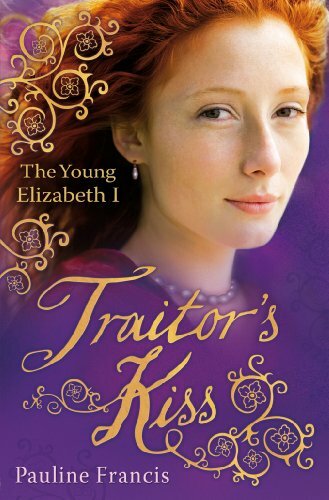 Her stepmother witnesses a kiss and Elizabeth is sent back to Hertfordshire in disgrace. Here she falls seriously ill and rumours abound that she is hiding a pregnancy. When Thomas Seymour is arrested for treason in a plot to overthrow King Edward, Elizabeth is implicated by association. Now it is up to her to defend her integrity - and her life.. The traitor's Kiss is a prime example of what I think YA historical should be and do. It is brilliantly engaging with characters that you are able to relate to easily. The story gives you a really good inslight to the times is is set in without overburdening you with tiny details. Finally the storyline is nice and pacey which keeps you wanting to read page after page. This story follows a young Queen Elizabeth and she as she struggles to deal with her background and status of being the daughter of Anne Boleyn. I thought the story was told well and in a really insightful way which allowed you to get a real flavour of politics at the time. I liked how accessible Elizabeth was as a character and found that the issues she was dealing with were very relateable to a modern audience. Certainly a book I would recommend and an author I will be keeping an eye out for in the future. This book sounds really good! Your review is great. Your blog is really good, I am could browse on it for ages.